The Parish of St Symphorian, Durrington is situated to the north of Worthing and encompasses Durrington and West Durrington. All are welcome at any of our services: we seek to include all ages. Our main service of the week is the Parish Mass every Sunday at 10am. Children are especially welcome at this service. In addition there are weekday Masses on Monday at 12noon, Tuesday and Thursday mornings at 10am and Wednesday at 7pm. 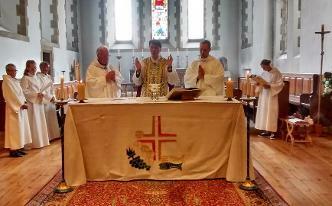 Mass is offered on Friday at 8.30am and Saturday at 9am at St Andrew's, West Tarring. St Symphorian's has a very active social life. You can find out more about this on the What's On page. The Hall is also used by various community groups. If you would like to enquire about using the hall please get in touch. Baptism and wedding arrangements can be made by calling the Parish Office on 01903 268109 or click here to email the office.